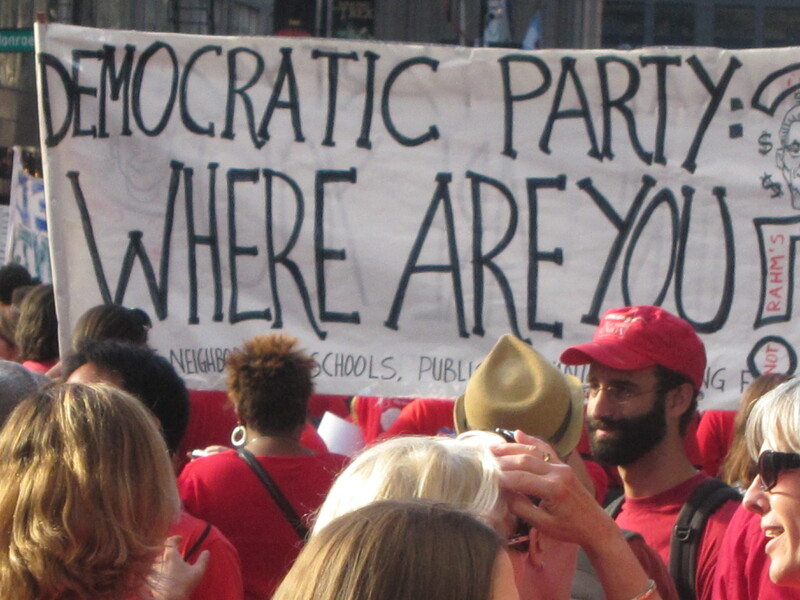 Striking members and supporters of the Chicago Teachers Union raise a banner shaming the US Democratic Party in 2012. On November 5, 2013, the Platypus Affiliated Society hosted a conversation on the Politics of Work at the School of Art Institute of Chicago between Bill Barclay of the Democratic Socialists of America and the Chicago Political Economy Group, Lenny Brody of the Justice Party and the Network for Revolutionary Change, and Leon Fink, a professor of labor history at the University of Illinois at Chicago. The panel was moderated by Ed Remus. The original description of the event reads: “It is generally assumed that Marxists and other leftists have the political responsibility to support reforms for the improvement of the welfare of workers. Yet, leading figures from the Marxist tradition—such as Lenin, Luxemburg, and Trotsky—also understood that such reforms would broaden the crisis of capitalism and potentially intensify contradictions that could adversely impact the immediate conditions of the workers. For instance, full employment, while being a natural demand from the standpoint of all workers' interests, also threatens the conditions of capitalist production [which rely on a surplus of available labor], thereby potentially jeopardizing the system of employment altogether. In light of such apparent contradictions, this panel seeks to investigate the politics of work from leftist perspectives. It will attempt to provoke reflection on and discussion of the ambiguities and dilemmas of the politics of work by including speakers from divergent perspectives, some of whom seek the immediate abolition of labor and others of whom seek to increase the availability of employment opportunities. It is hoped that this conversation will deepen the understanding of contemporary problems faced by the Left in its struggles to construct a politics adequate to the self-emancipation of the working class.”What follows is an edited transcript of the event. A full recording of the discussion can be found online at: /2013/11/06/the-politics-of-work-chicago-11-5-13/. BILL BARCLAY: I joined the Student Non-violent Coordinating Committee (SNCC) and Students for a Democratic Society (SDS) in the early 1960s when I was in college in North Carolina. I joined the New America Movement (NAM) sometime around 1974; I was on the political committee of NAM at the time of its merger with the Democratic Socialist Organizing Committee to create the Democratic Socialists of America (DSA). I then drifted away from the DSA but returned about four or five years ago to the DSA about the same time I and some other comrades founded the Chicago Political Economy Group (CPEG). I am going to use Joan Robinson's remark, "the misery of being exploited by capitalists is nothing compared to the misery of not being exploited at all," as my jumping off point. I will first talk about the kind of jobs program CPEG created and I'll presage that discussion by suggesting it looks a lot like the Nordic social democracy model. Then I am going to come back and look at that line of thought through a feminist lens and talk about neo-liberal capitalism. So let me start with the CPEG model. We spent some time looking at the U.S. economy and came to the conclusion that, as Robinson remarked, the misery of not being exploited at all was the sort of central dilemma. We were in a situation where there was long-term systematic underemployment in this country in 2007 and 2008, that is, before the crisis hit. We in CPEG asked: “Can we design a political program that addresses the problem and also has the potential for transforming the larger political economy?” So we put together a program with a number of points. At first we said, "We want to create a net of 4.5 million new jobs every year for a five year period and these new jobs, this new work, should pay a living wage.” At the time in 2008, when we sat down to design the program, the median wage was eighteen dollars an hour. We said that should be the wage of these jobs. We also recognized that there would be people who would want to enroll in the program over time that would come in without skills, so there would be a training wage of about eleven dollars and fifty cents an hour, as people learned the skills and got access to the chance to be exploited. We said that this should happen in three areas of the political economy: one, this should not surprise you at all, there is the problem of broken bridges, broken roads, schools, hospitals, and all of the physical infrastructure; second area was green technology, green manufacturing, and applications of green technology; and, the third area, was what we call social infrastructure. The question of taking care of the old and the young, the question of health provision, and the question education—what are sometimes called the caring occupations. So those are the three areas we said we should have an extensive jobs program that, over the five-year period, creates 22.5 million net new jobs. By our calculations at that time, this would generate access to work for everybody willing and able. Most of this work was going to be in the public sector—we recognized, of course, that some of these jobs would still need to be through contracts with the private sector—but most jobs would be in the public sector because that is the most efficient way to develop a social infrastructure, and, because we consciously wanted this work to be de-commodified (work that does not require the process of capitalist accumulation as in the private sector). We put this program together in August 2008. The guys who did the heavy number crunching estimated it would cost about 177.5 billions dollars a year, which doesn't sound like a lot until you remember that after five years, we are spending 887.5 billion dollars each year to run this program. Two months later, Hank Paulson walks up to congress with three pieces of paper and says we need 887.5 billion dollars to bail out banks, granted, that was not upfront but in total. We had worked to try to get legislative reform in. One way to look at the program is to say that this is a classic Keynesian program where you increase aggregate demand by bringing more people into the workforce. Another, slightly more sophisticated version, looks a lot the Rehn-Meidner model for the Nordic Countries developed in the 1940's. The Rehn-Meidner model argued that, if you pursue full-employment by squeezing the low-wage sector of the economy, firms would either move up the productive scale or they would go out of business. At the same time, using your increasingly profitable and productive private sector, you would finance a large expansion of the social wage through de-commodified services in a whole variety of areas in the public sector. And that really has been the growth model that most of the Nordic economies have followed for some period of time to a greater or lesser extent. Now, let me look at the Joan Robinson quote from another perspective, "the misery of not being exploited at all." Early socialists, to the extent that they considered gender as a category of capitalism, went back to Marx's distinction between use-value and exchange-value and noted, as Marx did in the opening chapters of Capital, that use-values often include domestic labor. Yet household labor doesn't appear on the marketplace, it doesn't appear in the sphere of circulation, and it's not part of the generation of surplus value. And some early socialists wanted to deal with the women's question by industrializing household labor, to move that labor into the sphere of exchange-value, to use that labor as a source of the accumulation of capital, and to develop class consciousness in emancipated women. Marx and early Marxists didn't think a lot about the question of class consciousness of people who weren't directly involved in the process of production. In one of the many ironies of history, which you find in capitalist societies, it appears that neo-liberal capitalism in the U.S. has accomplished exactly that. The simplest confirmation of this is to look at what the Bureau of Labor Statistics says are the fifteen out of seven hundred and forty occupations that are going to generate about thirty-one percent of the new jobs between 2010 and 2020. If you look at these jobs, they include whole-healthcare workers, childcare workers, nurses, orderlies, people who take care of older people, receptionists, and food preparation and serving—these are the kind of jobs, the kinds of use-values, if you will, nominally produced in household economies that are moving increasingly into the economy of the workforce, that are going to be the source of almost a third of all new jobs that are created. If you look at those fifteen occupations, twelve of them are done predominantly by women in the paid labor force and, in many cases, are overwhelmingly done by women. These occupations also reproduce, in many respects, the household division of labor between who does what kind of work. It probably won't be a shock to you to also learn that of these twelve occupations, ten of them are paid dramatically below the median wage in the economy as a whole, and often less than two-thirds of the median wage of the economy as a whole. So we have really reproduced many of the same inequalities that we find in the traditional, patriarchal, capitalist household that have just been moved over into the wage economy. And it is interesting if you ask what is asked of these jobs, of course it is labor time, but I would also argue that it is affective time. And women are seen as more affective—women smile more, women initiate more interactions with other people, and women deflect rather than reflect anger back. So the idea is that these jobs are women's work. Have the CPEG/Nordic model and neo-liberal capitalist model converged? Well, on the one hand, in both cases, a lot of traditional household use-values have been taken out of the household political economy and transferred into the wage-labor force, and these jobs are still done predominantly by women. But the differences are actually very significant when thinking about the politics of work going forward. In the Nordic model, what has happened is that these use-values have been socialized and have been produced and consumed in a socialized part of the economy, in de-commodified form. In contrast, the neo-liberal model, what you find is use-values have been privatized, and production and consumption is privatized in a wage-labor situation. You can, by the way, find very nice, high-level performers in these jobs. So the Nordic model and the neo-liberal model diverge, which in turn, leads to other divergences. If you look at the Nordic countries, you find that the female labor force participation rate is almost as high as that of the rest of the labor force, which is not true in the US. We find a smaller gender wage-gap and interestingly enough, in the Nordic countries in particular, we also find a solution to the question of how to structure one of the remaining, very important aspects of household political economy—parenting time. All of these countries, like much of Western Europe, offer maternity leave on the birth of the child. But these five countries, Sweden, Denmark, Norway, Finland, and Iceland, also all require the father to take some portion of the leave or the family loses it, in effect, restructuring the parenting time. John Maynard Keynes predicted that we would be working no more than twenty hours a week by the year 2000. In 1965, a Senate Committee that thought we would be working fifteen to twenty hours, wondered what we would do with all our leisure. But obviously, time has not worked out that way even though from the Civil War to the 1950s, the U.S. working week did decline, but since then we have actually gone in a different direction than Europe. The Nordic countries and much of Western Europe work anywhere from three to nine forty-hour weeks less than we do. Seventy-five percent of people in the U.S. report working more than the forty-hour week; less than twenty-five percent report the same in Norway, Finland, Denmark, and Sweden. The Nordic countries, as they stand today, are probably the best societies ever created by humans to date on this planet. So there are several questions: How did they create them? And I think you have to talk about the dynamics of both gender and class. Second, where are they going? The U.S. knows the answer, but is always cutting back the social safety net, always requiring more work. Third, can we imagine better societies, and if so, how can we get there? So I'll conclude by pointing to a couple of areas that are most interesting in terms of what is going on today: the movement among low-wage workers, many of which are women, and in terms of something which is very near and dear to my heart, the effort to generate more revenue to provide for various social needs by things like the Robin Hood tax. LENNY BRODY: First of all, I would really like to thank Platypus, as this is one of the most important topics for Marxists. Also, a disclaimer: although I am a member of the Justice Party and the Network for Revolutionary Change, I am not speaking for those organizations. Marx established a scientific way of examining historical development. I think the concept of historical materialism is centrally important to the understanding of revolutionaries. What historical materialism means to me is that the way things are produced determines how societies are organized. A simple example is that agricultural societies are organized in one way whereas industrial societies are organized in another way. So the key to understanding how societies develop resides with an understanding of how things are produced and the methods of production; accordingly, to understand how societies change, you have to understand how those methods change. I also think that one of the ways of looking at capitalism, along the lines of historical materialism, is that capitalism developed under certain historical conditions and it has gone through certain stages of development. Under other historical circumstances capitalism reaches the limits of its developments and is no longer a sustainable society. And you can see that throughout history, that different societies go through stages of development and then disappear. So it is entirely reasonable, from this point of view, to try and figure out what are the conditions under which capitalism will no longer be an effective, sustainable system of organization. Marx pointed out, in a famous quote about historical materialism, that when a situation develops, such that society is no longer sustainable, society enters a period of social revolution: I believe that is the situation today. About Marxist economics: I think when Marx talked about the growing organic composition of capital, which means that, as capitalism develops more, and more is invested in machinery, less is invested in labor. He also pointed out that there are countervailing tendencies. The organic composition of capital led to a falling rate of profit, but these countervailing tendencies moderated that. I would like to argue that, under today's conditions, those countervailing tendencies are minimized and that capitalism is entering into a period when it is no longer sustainable. That analysis is based in an understanding of the development of technology, of computers, and of robots. During World War II, the growth of computerization and the research into computers accelerated, so that by the 1970s and 1980s, this had swept through the economy and transformed capitalism as we know it. Some of my own history is relevant to the development of this understanding of automation and computerization. The upsurge in the 1960s, which basically stemmed from the Civil Rights Movement, reduced by the 1970s to a great interest in Marxism. There were several Marxist or Communist parties formed in the 1970s in opposition to what we called the revisionist, Soviet Party and pro-Soviet Parties around the world. In the mid-1970s, there were three or four of these parties, and I helped to found the Communist Labor Party (CLP). One of the leading figures in the CLP, a theoretical thinker, was Nelson Peery. He was an older, African-American man, who had been in the Communist Party and oriented the CLP around the study of Marxism. At that time, one of the main criticisms of our party was that we were spending all our time studying and not enough time in an actual movement. In any case, I think that was a very important preparation. What happened is that a lot of us went into the factories in the ’60s and ’70s and you could tell by the ’80s that there were very few factories to go into. The de-industrialization that had taken place was pretty clear. It was during the 1980s that the CLP began developing an understanding of this transformation of the working class and the different historical condition that capitalism was moving into. There have always been utopian novels about how the future will be a time when machines do all the work and humans would have the leisure they want. I remember how reading Looking Backward by Edward Bellamy really impacted my outlook. By the 1960s, as computerization began to take place, there was a lot of discussion about automation, the work week, and such things as are spoken of in that quote from Andre Gorz, for instance. However, when you look at the economy in the advanced capitalist countries in the 1960s, it should be clear that the workers in those countries were benefiting from the exploitation of the neo-colonial world; what these economies were enjoying were what Lenin referred to as “super-profits.” Marx had noted the relationship between the Irish and the British working class and remarked that, until the Irish workers were free, the British workers would never be free, and Lenin was saying the same thing about the exploitation of the colonies. So it was these super-profits that really enabled the prosperity in the post-war period and into the ’60s; super-profits were also what allowed people in the advanced countries to talk about the reduction in the work week and automation, although that was not the case for the rest of the world. Today, globalization and the internationalization of the productive process has changed that situation. You can see the development in the so-called “third-world countries” and how the standard of the living is being driven down in the U.S., Europe, and the advanced, capitalist countries. There is a leveling out of the international economic situation—though it has not yet been achieved, it is going in that direction. I listened to a recording with Stanley Aronowitz and George Caffentzis1 where the latter, arguing against the "obsolete worker hypothesis," stated that capitalism could continue without workers. Well, that is not the case. The elimination of the worker and the reduction of the work force leads to an irresolvable contradiction within capitalism. That contradiction is an indication that capitalism is reaching the limits of its development. The other point that he made, which is made often, is that when you look at things internationally, there is a growth of the workforce. Well, that also is not true. Considering the situation of industrial development in China, India, and Brazil, it is evident they have not been able to absorb the entire surplus of agricultural workers. So although there is a increase in number of industrial workers, the labor force participation rate throughout the world has been declining since the 1980s. In fact, it is really clear that the primary problem in China is that the Chinese economy is not able to absorb all the agricultural workers who are pouring into the cities. So the point, which seems like common sense, that the workforce is growing internationally, is not true either. The current economic crisis is very significant. Capitalism in the 1800s, rising capitalism, was one historical formation. It was followed, in the 1900s, by capitalism as imperialism, which was another historical formation. We have to look at capitalism today as operating under different conditions and ask ourselves what those conditions are and examine what their potential is. The hypothesis that I am putting forth is that capitalism has reached the point where it has entered into permanent crisis. If you look at the recessions from 2000 on, the jobless recoveries, they are not full recoveries. Everybody talks about the fact that these recoveries do not match the previous cyclical downturns and what is happening is that the cyclical crisis of capitalism is beginning to merge with the historical, structural crisis of capitalism, and that capitalism, under these conditions, is becoming obsolete. It cannot regenerate itself, it cannot sustain society, and society is entering an epoch of social revolution that demands the transformation of our economic system. The Economic Policy Institute, which analyzes the status of the American working class, noted recently that the labor force participation rate in the U.S. has declined quite sharply since 2000, and since there have been so many problems in the economy, we can't really use that as an indicator. Well, it is the indicator of what has happened, although a lot of economists refuse to recognize that fact. It is clear that industrial society, the industrial proletariat, and the large concentration of workers in the workplace figured in any kind of strategy for revolution that Marxists in the past formulated—this is not the case today. I mean, to base a strategy on that understanding today is fruitless, since the point of production is no longer the center of class struggle. Unions have become peripheral to the revolutionary process and there are changing forms of struggle and changing forms of organization that are developing. Increasingly, the struggle is not employer against employee, but rather the people of this transformed working class against the government, demanding the necessities of life, which is the key struggle that is going on. I think at any particular point in history there is usually a key link that pulls forward the process in revolution. Today, in terms of the mass movement, the key link is developing a third political party. There are no organizations amongst the workers that are capable of fighting the onslaught of neo-liberalism, and we must have some form of organization to defend ourselves. I am active in the Justice Party because I see that as a viable form of organization. The other key link is to develop an organization of revolutionaries. Without a grouping based in a Marxist understanding, wherein that understanding is applied to the strategies and tactics necessary for the working-class—that is, without an organization of revolutionaries—no revolution will be successful. LEON FINK: Unlike Bill and Lenny, I have been interpreting the world more than changing it, since I entered academic life. But I will say that my trajectory was informed in an important way when I studied with E.P. Thompson, author of The Making of the English Working Class, many years ago. This forum is dedicated to the politics of work and there is a tendency, especially among labor historians, to wax nostalgic about some work of a former period and to see the present as a matter of crisis or decline. It depends, however, on what the starting point is. Maybe some of you have seen, as I recently did, the film 12 Years a Slave. If one thinks about forced slavery, one might also think of today's Chinese autoworker. Yet if one broaches the idea of a crisis for contemporary workers in the United States or says "we are in crisis," the response might well be, "What do you mean, Kemosabe?" That is, we know that there was a severe crisis of unemployment, underemployment, and brutal working conditions, but we can find that in virtually any historical epoch. After acknowledging that, I want to look at further, to cast a quick eye over what I see as some qualitative changes over the last 100 years and then talk about some instances of what I see as constructive ways to approach the politics of work today. Let me frame my comments about the past by referencing a few major works I am sure many of you are familiar with. In the 1920s classic sociology work Middletown Robert and Helen Lynd looked at the town of Muncie, Indiana as an example of what they thought was a typical American town, which wasn't what they thought it was. They noted, as early as the ’20s, the key transformation of work; namely, when they looked back at the Middletown of the 1890s, they saw small-scale production led by skilled craft-workers in small shops and then, by the ’20s, they saw a world defined much less by its connection to work, much less of a sense of people having a purposeful human activity in their work, and much more of consumerist approach to work. That is why the book's chapter "Why do they work so hard? ", probably the most classic, was really about the sense of what is driving people to work in middle America and their attempt to find fulfillment outside of work rather than inside of work. Indeed, the Lynds describe how the culture was like an organism caught up in the processes of its own digestion. I think that if we jumped ahead from the ’20s up to the early ‘70s when Studs Turkel's classic work Working was published, we would see again that, although there were a few exceptional workers who echoed the 1890s sense of connectedness to their work, to a purpose, a sense of fulfillment, an "I made that” sense of skill, and a homo faber ethic, that wasn't a dominant theme in 1970. The dominant theme again was what the Lynds found in the 1920s, alienated work, a sense of people not being respected at their workplace, and a sense of finding fulfillment outside of the workplace itself. Working, of course, appeared in a period of the post-war boom. Out of that period of the post-war boom emerged a whole set of critiques of the capitalist workplace and attempts to transcend it. The 1970s ushered in, among the liberal policy types, politically more in the center, a whole movement for the quality of work-life. Managerial moves, emphasizing a more human relations approach to work, were made in the direction of greater worker participation, both in the social-democratic context and even in the capitalist context. Further on the Left, I would put Gorz's work, beginning in the ’70s and then continuing through the ’80s, as imagining a world of less and less alienated labor, in particular, by spreading work out itself and having less of it. That was a common reaction by the end of the boom period. It probably reached its apex of policy in France with the 30-hour work week. It is not surprising that that movement was cut short by change in the global economy, by what I call the great unbuttoning of national life beginning in the 1970s, with the beginnings of what we subsequently began to call globalization. Let me switch now to a specific case study I was involved with, namely, the area of maritime labor, the workers in merchant shipping, merchant seamen, or the merchant marines which I examined in my last book. By 1970, unions had taken firm root and had advanced their positions to a considerable degree and fleets dominated the world, namely the British, the German, the Scandinavian fleets, and to some extent the American and Greek fleets. These fleets were strongly unionized; they had bargained down vacation time, overtime pay, benefits, and recreational centers. And by the 1970s the fleets were opening up the world of maritime employment to more and more women. There was talk, in short, on a real focus on quality of life. In that same decade, however, that was also the beginning of what we began to call “flags of convenience,” where the great merchant flags of the world switched from those of Western countries to Panama, Liberia, or the Marshall Islands. That is where the owners registered their vessels and in turn sought refuge from the strong unions and taxing authority of Western states. It was a kind of advanced guard of outsourcing—something that we have seen take place across other industries in subsequent years. Let me come back into the positive. The fact is that, because merchant shipping was always an international occupation, because it had in effect experienced transnationalism since the late 19th century, it had unions and worker organizations who were also well-versed in that phenomenon. In response to the threat of globalization, there was a serious response that continues to this day. Namely, it was true that in the late 1970s, the labor force in the maritime world shifted from Western unionized workers to non-union, Asian workers, particularly Filipinos, who continue to be recruited as seamen. Initially, there was a great tension between the standards of the Western unions and this new labor force, particularly on these flag-of-convenience fleets, third-world oriented practices. But the unions of seafarers got together with the unions of dock workers around the world. They both happened to be in a federation called the International Transport Workers Federation (ITF), which developed an international boycott campaign against the flags of convenience, effectively boycotting them in key ports around the world if they did not sign up with the ITF standards, if they did not meet a package of standards that called for minimum wages and working conditions for their flag-of-convenience crews. With just-in-time production going on around the world with a Walmart economy, this was a tremendous pressure point. So the flags of convenience had basically signed up and in return, this welfare fund gives shares to a certain amount of its funds to the dockworkers unions who enforce the potential boycott and they exchange money between the third-world seafarer unions and the Western unions with whom they are affiliated. It's not a socialist ideal of solidarity. It's not based purely on the ideology of solidarity, but it's kind of a combination of cash-end cooperation at the same time. In a world where we tend to vacillate between feeling that if something is not utopian it is sure to be a disappointment, this is an example of not so much the race to the bottom, as it is a race to the middle and one that is built on a pragmatic cooperation across national lines that I think could be employed in other areas. Let me end with the suggestion that, as with oceanic shippers, retail manufacturing—the Walmart economy—depends on the on-time delivery of diverse products to consumers across the globe. The nexus of land based warehouses, themselves an industry with a large labor force, from whence universally containerized goods are regularly shipped by rail or truck, duplicates many of the structural features of the port. Could not joint action by the Teamsters, railway unions, and distributive workers create a wedge into the unorganized depths of the Walmart economy? ED REMUS: How do you imagine the constituency for a left politics of work? A second question, related to that, would be how do you understand the history that the Democratic Party, for much of the 19th and 20th century, why did it, rather than the Left, capture the imagination of the American working class and organized labor? What lessons do you draw from that history for the present? If we look to the 20th century, we see regimes of full-employment really in welfare states and social democratic countries, under fascism and under communism coming into being, but these now seem to be passing away. Do you agree with voices on the Left that suggest that these are passing because the actuality or threat of revolution is no longer on the table? LB: The Justice Party is making its main campaign to fight to raise the minimum wage, and I think that is one of the important fights that the working class will be waging. On the other hand, I think it's very important to understand the real economy at this point because of automation and computerization, every investment into new facilities leads to a reduction in the workforce, because what it does is it eliminates the old facilities and brings online the kind of productive process that employs fewer and fewer workers. This is the example with the jobless recoveries, in which GDP growth, investment, is decoupled from employment and that, regardless of the growth and investment, the rate of labor force participation is dropping. I think two months ago the unemployment rate dropped and that was entirely due to workers dropping out of the workforce. So I think that is a thing we have to grasp and understand while we're in this struggle for workers employment. A little bit more on the constituency question: It seems to me that the transformation of the working class is a very important thing to examine, and what we really have now is what some people are calling the precariat, which is a workforce that moves in and out of employment, or is made up of contract workers and underground economy workers. When you really examine the situation today, the struggle for significant reforms is, in a lot of ways, a lot more utopian than the struggle for revolutionary socialism. Under these conditions, the only thing that can really solve the problem is the revolutionary transformation of society. I think that the Democratic Party, at least since World War II and really before that, has been a conduit of imperialist super-profits that have been fed into the working-class and that is how they won the allegiance of the working class, especially in the United States. Once the worldwide economic crisis hit, the Democratic Party served the capitalist class, and it is clear that it is not a real alternative for workers. I think this is why there is a necessity for the growth of a third party. LF: Göran Therborn noted in the New Left Review, that the 20th century was something that we could talk about as something that belonged to the working-class, at least in the European and American context. There was an equalization of the living standards, at least compared to what had been before, to a remarkable degree within Western nations. We talk today about the rising inequality and measure that against the 1950s and ’60s when there was a much smaller gap between owners or managers and workers than there is today. That is, for much of the 20th century, much of the unions and the Democratic Party were agents of relative equalization. But I don't disagree that this came with imperialism, because the same period that saw the equalization within nations, also saw a sharp differentiation between nations. But in the twenty-first century, Therborn suggests, what we see is the opposite. That within nations there is a rising inequality, just as we see in the U.S., but compared to what had been the gap between say India or China and the U.S. or the Asian tigers, those gaps have narrowed as say the relationship of Brazil or Argentina to the U.S., those gaps have narrowed. But even within those societies there is great economic inequality that should produce a constituency for a class based politics. It is much easier, however, for the Democratic Party to straddle the social issues than the class issues—witness the really appalling response to the employment issue by the Obama administration. So I think that there is an opening for the Left, but again to come back to my argument about the seafarers, I think this also has to be done for the most part ultimately in an international or transnational context. BB: The question of who is the constituency for the revolutionary politics of work is a complicated one because we have two very different strands of work-life going on in this country. We have people who are desperate for work. On the other hand, we have people who remind me of an apocryphal dialogue set in the 1960s between a foreman at an auto assembly line and one of his workers, where the foreman asks why do you come to work only four days a week and the worker says because you can't make a living coming to work only three. So we also have this demand for less work, for refusal of work. Both of those things are part of the constituency, but putting them together is a problem. I do think that—I am going to pick up a little on what Leon said—the formulation that Occupy came up with, the one percent vs ninety-nine percent, was brilliant in terms of thinking about where your constituency might be and not totally inconsistent with Marx's analysis of where capitalism would go. Finance capital has changed the dynamics of the economy in pretty fundamental ways; it has also changed the political dynamics of the party. So at this point, in political terms, class struggle runs through the Democratic Party. The problem we face in terms of parties is that we are in a federal system, which means it is a winner takes all system, and we are virtually unique among modern industrial countries in terms of this structure, which means if you are going to become a third party, you have to become first or second party very, very quickly or else you remain in the shadows and margins of political life. So the only really good example we have of this is the Republican Party back in the 1850s when it went from being a third party to a dominant political party in this country. If I only knew how to replicate that! Bill, you outlined a detailed program for solving unemployment and equalizing employment in the country, but you also said that due to the rise of finance capital the political system has been thrown up in the air. So what political formations do you see among working people that could possibly be strong enough to implement the program that you laid out? BB: With the 2008 election, many of us on the Left who had read the history of the New Deal thought, “wow, it is going to happen again,” but what we forgot was the right was going to resist and understood the risk that it might happen again in a much more far reaching manner. We had Wisconsin, we had Ohio, we had Occupy, and we had the Chicago Teachers’ Union. When I spent my eight or nine years in NAM, we adopted Gramsci's political slogan as our mantra, "Pessimism of the intellect; optimism of the will." So my belief is that at some point, these upsurges—which you can't really organize or create, but you can prepare for—at one point these upsurges will come together and they will create this kind of mass movement around work and jobs and a whole lot of things in our lives. Can I tell you how to do it today? No I can't. LB: Think about the Republican Party in the 1850s when slavery became the central issue of the country. The Whig party didn't deal with it and it dissolved. The Democratic Party didn't deal with it and the Republican Party was born and, in a short period of time, took over the country. What we're experiencing now is a fundamental economic crisis. The Republican Party is already splitting, the Democratic Party will be split, and in a short period of time there will be a third-party emerging. Now the problem is, whether that party will be a progressive party or a right-wing fascist party, since most of the Left doesn't have an understanding of the electoral process. At this point there is no defense against a right-wing thrust in this country because capitalism is in crisis and it will move to the right and crush any kind of resistance. Right now, you can look around, if you want to rely on the Democratic Party, you're going to be disappointed just like we were disappointed with Obama. You have to have some form of organization. On my understanding, the Democratic Party was never something to funnel workers’ struggles through. Revolutionaries participated in the Democratic Party in order to lay the basis for a working-class motion because that was where the workers were. So it doesn't mean we thought you could accomplish things through the Democratic Party, but that was an organizing approach. The great lesson of Marx is that the objective conditions teach you what is possible—freedom is really the recognition of the necessity of the object. On this issue of third parties and the Democrats: I wonder what the discussants think of two historical examples. The first is the example of Bayard Rustin in the 1960s in From Protest to Politics, in other words, splitting the Democratic Party around the Civil Rights Movement and turning the Democratic Party into a labor and black party. Rustin was, of course, unsuccessful and what happened instead was we had the Republican-centered strategy and the transformation of southern Democrats into Republicans. The other example is a project headed by Adolph Reed, who was involved in the Labor Party USA in the 1990s, which was an attempt to essentially capture the labor parties' contempt with the Democratic Leadership Council's neo-liberal turn in the 1990s, marked by the election of Bill Clinton and Al Gore. LF: I do think what is important is to think about moments of possibility and paths taken or not taken. For example, it seems clear to me there are a lot more people in motion and frailty about the current political equilibrium than there were in Adolph Reed’s Labor Party, which spent much focus, energy and discipline on strategy and didn’t have nearly so as much effect as the more spasmodic moment of Occupy. Even as a spasmodic moment, Occupy has left an imprint, and you can't understand Elizabeth Warren, de Blasio's campaign, or even Los Angeles’ labor-centered, Democratic politics without it. If you follow Rick Perlstein's writings about Chicago, he suggests that there is a possibility of a Left movement combining the CTU and dissenting voices in the immigrant community/African-American community of Chicago as an alternative to Mayor Rahm. I would like to think so too, but I also think that if you think back to the heyday of Occupy, was there an opportunity missed? What was it? We know that things kind of jumped from the Madison moment to Occupy to the CTU, and we can point to lots of points of light and see that this is a period of ferment in this country, but I don't see a clear compass about strategy so much..
LB: I was active in the Labor Party. I think that when you evaluate what happened, you can see that the union leadership was so tied to the Democratic Party and that the Labor Party was so reliant on the unions to finance it, that it became impossible to move forward. It disintegrated with the death of Tony Mazzocchi. Although it is very hard to imagine a progressive third party without heavy union participation, the reality today is that the industrial proletariat is gone, massive workplaces are gone, and the only unions are some of these public sector unions. You have to develop an understanding of the nature of the workforce and the nature of the struggle and what kind of party will be built. It seems to me that it is very difficult to do it with the unions and, if you can imagine a third-party, it's got to be much broader than the old conception of the union based party. I don't want to get to much into the ’60s stuff about Bayard Rustin, I am from that period, my evaluation of him is very negative. I think he corralled people into the moderate sector of the Civil Rights Movement, and it wasn't a genuine attempt to form a progressive party. The fight between SNCC and the more conservative leaders there was clear, and Bayard Rustin was on the wrong side. So capitalists are replacing labor with capital, laying off a hundred thousand workers and replacing them with 5 computers and a very skilled computer operator. So that is one response, but what about another response, which is the substitution of cheap consumption for higher wages? Instead of actual money and actual political power, the workers could be given cheap internet, cheap entertainment, and other things. LB: Aronowitz talked about how the struggle of the workers is what pushes the capitalists to automate production, and I really don't think that is correct. That there is an internal dynamic of capitalism and the competitive nature of capitalism and the need to undersell their competitors is what causes them to automate. So it's not a voluntary thing that they decide, well, the workers are going on strike, so I think I'll automate; they are forced to automate due to competition. I think that that's the key thing about automation, that you can begin seeing the future of a real society where there is distribution according to need, that we can produce a kind of abundance while taking into account the protection of the planet of course. But the technology now exists that we can supply the basic needs of all the people if the means of production were collectively owned. Yet capitalism is going in the opposite direction, it's impoverishing people, there is growing disparity, which underscores the importance of automation. In a lot of ways it seems like we are being forced to fight just to survive. The government is cutting the entire social safety net and is giving very little. BB: One of the reasons I highlighted jobs that demand affective time is that they are not easily automated and are very difficult to outsource. You can, however, draw on the international female reserve army of labor and staff some of those jobs and keep the wages low. That remains a reality and a real problem. I think one example that might be interesting to discuss in terms of debating the pros and cons of social democracy is 1980s France, where we did have a social democratic party take power, and according to the sort of mainstream narrative, it faced resistance to a social democratic regulation of the economy that lowered the rate of profit. The push back took the form of social democrats eventually implementing neo-liberalism. Two sets of questions: First, if you wouldn't mind commenting on an idea, would imposing regulations or imposing a jobs program in the current society would be sustainable? What is your response to someone like Andrew Kliman who would raise the example of 1980s France in the face of social democracy being spread to the U.S. or other capitalist countries? How can one challenge global capitalism and motivate people, inspire people to take tremendous risks, without pointing towards a revolutionary conception of society? Can we even have some sort of rise of standards without fundamental revolutionary change at this point? LF: I believe we can. France in the 1980s was a national model. The U.S. is not France; we've already been effectively deindustralized in many respects. Manufacturing, which is the easiest to transport or outsource, is not the same the service sector, the health sector, or the food services sector. There is nothing in my view that stops a 15 dollar restaurant wage from coming into existence—that is not impossible, although it is politically difficult. There is nothing that would bring down the system if restaurant workers had a 15 dollar minimum wage. I think there is every reason why that should be on the table, and there are many other examples. I think there are areas where there can be capital flight, but we shouldn't just subscribe to a scary image of capital flight because we think there are so few alternatives, since I think the alternatives are there, but our imagination is failing us. LB: I am not talking about capital flight, I am talking about fascism. I am talking about fact that the economic crisis is so serious that we have to be aware of what we are fighting. I am a supporter of the fight for 15, the fight to raise the minimum wage, I think that is the cutting edge of the struggle today, but if we think we can implement Keynesian reforms, we are going to run into problems. I think what is going on in Europe and in the Nordic countries is a lurch towards fascism. Europe has a history of fascism. And while the United States doesn't have that same history and our forms will be different. In Europe the fascist parties are growing like crazy. It's not just Greece; it's England, it's France and in the Nordic countries, it’s a reaction to the number of immigrants. I think 1980s France is not the France of today. Today there is a fundamental crisis going on. Everybody knows that quantitative easing is going to be eliminated. Everybody knows that the Chinese have been producing just to employ people and that that model has reached the limits of its development, and they're going to be changing the third plan of what is going this weekend is going to change that. You know Europe is not recovering from the crisis. We are facing an even worse economic downturn than in 2008. We desperately need an organization of revolutionaries that can analyze the situation and direct our strategy. This thing that Platypus talks about, that the Left is dead, it's really dead, and you can say, “Long live the Left,” but there is very little of it that remains. We are facing a very serious situation nationally and internationally. Religion is appealing to those in Africa, where it's the Catholics and the Protestants, and in the middle-east, where it's the Muslims. The Left is in a very bad shape internationally and in the United States, and we have to have a realistic estimate of what we are facing. 1. Stanley Aronowitz and George Caffentzis, "Techology and the Labor Process", roundtable at Historical Materialism (New York, 2013), recording available online at http://wearemany.org/a/2013/04/technology-and-labor-process.